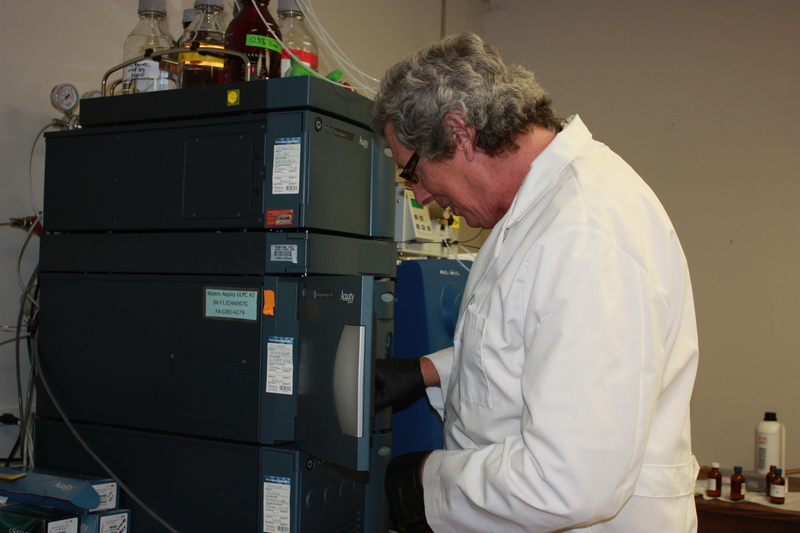 Dr. Michael T. Meyer in the laboratory working with a ultrapressure liquid chromatograph/tandem mass spectrometer. Photo credit: Megan Maksimowiczl, USGS. U.S. Geological Survey (USGS) scientist Dr. Michael T. Meyer has had a prolific career, publishing 60 journal articles and 45 USGS publications. Mike's publication record has recently led to his designation as a Thomson Reuters Highly Cited Researcher, ranking among the top 1 percent of researchers from 2002 to 2012 for most cited documents in their specific field (Environment/Ecology). He was listed in Thomson Reuters' "The World's Most Influential Scientific Minds 2014" report. Mike has dedicated his career to developing innovative and sensitive analytical methods to measure contaminants of emerging concern, such as triazine and acetanilide herbicides and their degradation products, glyphosate and its formulation additives, antibiotics, pharmaceuticals, personal care products, phytoestrogens, and steroid hormones. Mike has applied those methods to study the fate of these understudied organic contaminants in the environment. His collaborative efforts with a team of USGS scientists provided the first published documentation on the national occurrence of a wide variety of hormones, pharmaceuticals, and personal care products, and other wastewater contaminants that were found in surface waters throughout the United States in 2002. This article received the USGS Shoemaker Award for Product Excellence in 2003. Mike and his coauthors also received the Rudolph Hering Medal from the American Society of Civil Engineers in 2003 for the most significant paper in environmental engineering, which focused on removal of antibiotics from water through conventional drinking-water processes. The USGS employs scientists with diverse expertise in order to solve the critical issues facing the Nation. Mike's recognition as a Thomson Reuters Highly Cited Researcher shows that he is a committed public servant dedicated to advancing science—the hallmark of a scientist that is in service to others.